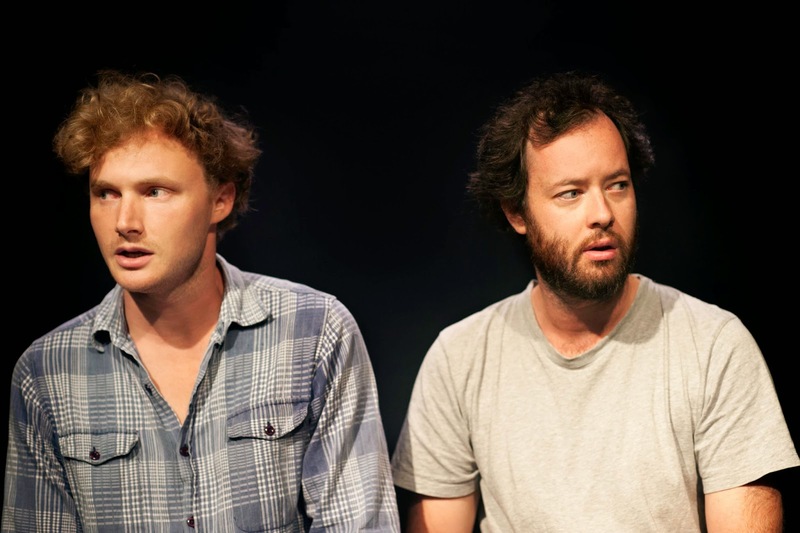 Red Line Productions presents MASTERCLASS, written and performed by Charlie Garber and Gareth Davies at the Old Fitz Theatre, Woolloomooloo. 14 Jan -31 Jan.
MASTERCLASS at the Old Fitz, devised, written and performed by Charlie Garber and Gareth Davies, begins with two men coming onto an empty stage and talking. Apparently, having worked together in A MIDSUMMER NIGHT'S DREAM and AS YOU LIKE IT at Belvoir, and though given some leeway to interact 'creatively' together by Director, Eamon Flack, these two men felt somewhat 'hampered' by the requirements of someone else's text (Shakespeare) and decided that they wanted to have "absolute control" over what they gave an audience. This is the third iteration of this show. It began in 2011 in a 'subterranean' night club, revived in 2012, and now, again, revived, as the opening offer from the regenerated Old Fitz theatre space, under the new artistic curation: Red Line Productions. Hmmmm! MASTERCLASS, their only choice, to re-vivify the Old Fitz? One wished the writing was wittier, and not just the revelation of the comic eccentricities of the entwined minds of the performers, having a bit of fun of a 'shaggy dog' proportion. I understand there was no Director - it is, literally, a 'selfie' - and with no outside eye to provide provocation obstacle to urge some more clarity and spine to the evening, MASTERCLASS can meander down many a dead end. However, on the night I attended, there were a lot of people who did 'want' to travel with the "bros", for they had to merely walk onto the stage - to appear - for the laughter to begin. Devotees who knew the show from before, or, fans of the performers? Both, maybe. The performances are 'eccentric'. The skills, despite the 'faux' intent/mock, are really very secure. The Lighting Design, by Benjamin Brockman, is particularly assured, and an asset to, essentially, an empty space - the theatre, itself, has no seating, just bare platforms. An empty space, indeed. I wondered, later, whether you needed to know about the making of theatre, and its 'mysteries', to have a really good time? And, on the other hand, if you do have that knowledge, is it really a masterclass? Or, is that the point: it is something else? Can you sense my ambivalence to the performance? Do you need that loosening beer, or glass of wine, from the bar upstairs, to open up one's receptors? For myself, and my companion, MASTERCLASS, was not a completely rewarding night. As you like it, or not, then. It was only an hour in length. One hopes the content presented in the Old Fitz space, in the coming season, is more rewarding than this slight 'cabaret' turn.